We've whooshed through another week to another Friday! In fact, it's the last Friday of another month down the drain! Slurp! But never mind about that. 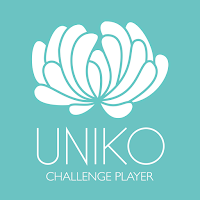 It is my pleasure to help you halt time for a few minutes while you are here enjoying this reminder: we are halfway through the current challenge at Uniko. It is an honor for me to be co-chairing the podium as Guest Designer with the sensational Wiebke! Last week a lot of you wondered what the story was on this charming house. Do fairies live here? Ganomes? Ginger cookies dressed up as human boys and girls? No, none of those things. This sweet home^ is in the town of Valentine, Cherry County, Nebraska. The home was originally built in 1922 by the mayor, Rutherford Harvey, for his bride. Rutherford was lucky enough to marry one of the daughters of Edward Valentine, the town's founding father. Her name was Lacey. The Harvey-Valentines were well-loved by the citizens of Valentine. Together they had five children: Lavender, Lilac, Persimmon, Rose, and Pepperoni. All of the adult children and their children currently live in other fairy tale houses on the 750-acre homestead. This main home is the residence of Lavender and Lilac, both widowed. Once a year, the entire family opens their hearts and homes (and homes with hearts) to the public to celebrate "SUMMER" from August 21-September 4! Here at Uniko, and we hope in all of Blogland, we are celebrating right along with them! My cousin Eunice happens to be the Foyer Florist for Rose (who, if you can believe it, married Stephen Bush!). I made this card as an inspiration for Eunice and to inspire you to play in the challenge. I used a white base and a green marbled mat from an ancient set of blank cards that I've had forever. The flower box was made with a Poppystamps die "Grand Window Box." The pretty posies are from the Uniko set "Beautiful Blooms II" and the white heat-embossed kite-tail leaves are from the Uniko set "Natures Treasures I." I do hope you will join in the fun at Uniko! I know there are tons of details in the photo that you can draw inspiration from. 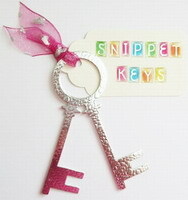 Or just make a card with flip-flops or sunshine or anything that makes you think of summer! I've made a QACAS Christmas Card. The papers are a garden green from SU and a lovely light green unknown textured paper from my stash. The red and green plaid is also from GKW. 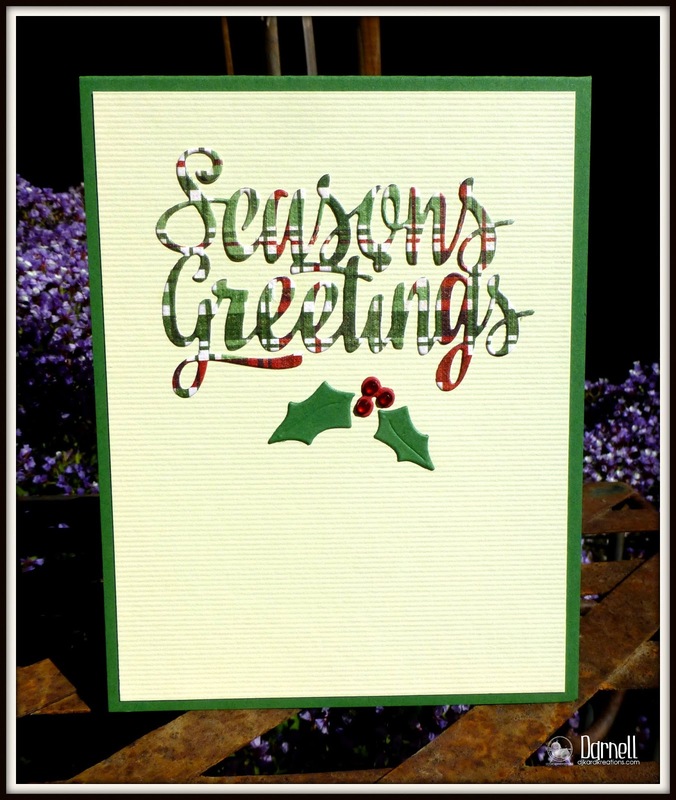 The NBUS "Season's Greetings" die and holly are from Avery Elle. I added some red gems to plump up the berries and that's it, friends. This was so simps considering the festive result! And it's easy to mail! 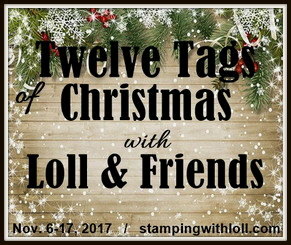 Addicted to Stamps and More: CAS (clean and simple). Merry Monday Christmas Card Challenge: Light green, dark green, and red. Time is running out for linking sponsors, so if you are on a DT for a company that you think might want to sponsor this next NBUS Challenge, have them contact me at darnell dot knauss at gmail dot com. Thank you! ^Everything regarding the home is a total lie. I'd love to hear what you think the story is! PS to Sandi. I couldn't respond to your no-reply email. It's from Technique Tuesday. Thank you for the head's up so I could edit my post! beautiful cards Darnell, I simply adore the second one! Gorgeous cards Darnell, and thanks for the back story to the house. That Christmas card is a stunner, and the floral on puts me in mind of my (late) mother, who loved floral art. I am so glad that you told us the history behind the house, it is such a lovely story (although I am not sure about calling a child Pepperoni...). I love your first card, the background really sets the flowers off beautifully. Fabulous cards, both simply delightful. I love, love, love reading your blog! You never cease to make me smile and inform me - a great read to start the day. Take super care and have a great weekend! PS. Can't wait for your new challenge to start!! Oh Darnell...seems like you are on the tease today! but I love your cards and that QACAS 2nd one is a real winner! You are always full of ideas and inspiration! Great history of the fancy house ! Love your Christmas card ! And of course the lovely flowers ! LIES! ALL LIES! It's a cool house, though, especially if you want to make a statement. What a great story about that house!!! Except, trying to figure out how poor Pepperoni got his/her name! LOL!! Love love love your cards!! Gorgeous colors!!!!! Two great cards, Darnell! The flowers are lovely and colorful and I adore the font on the second card. I was wondering about your house story. Definitely suspicious when I saw the name Pepperoni. Liked how you snuck in your fess up. ;) Love your humor and creativity! Hope you have a fantastic weekend!! 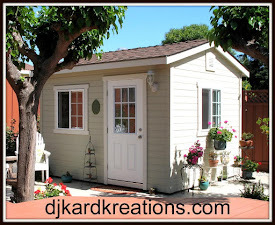 Thanks Darnell for the story on this so lovely house!! Before, I thought that was a cartoon hose :D I just adore it!! 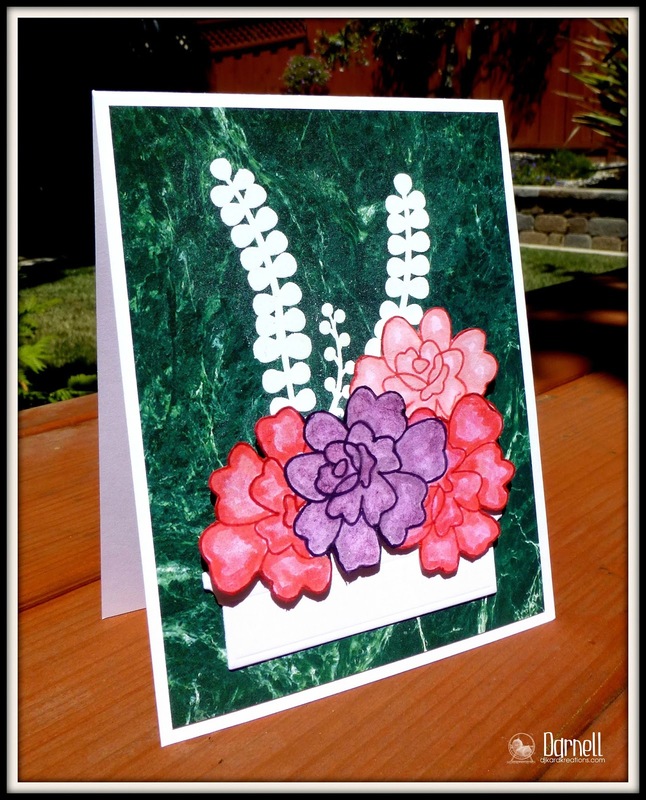 Both your cards are beautiful, love the Beautiful Blooms II on the green marbled mat, and the second one is really elegant, so festive! You know, D... I just don't know if I believe this story ... Pepperoni? Pahleez! But I do love your cards - totally unbelievable! Lacey gave you away, Darnell, but you are quite the story teller. ;) Your window box of blooms is lovely and they really pop on that marbled background. That holiday day is fabulous and out of piaid? Even more so. Both of your cards are spectacular. Wonderful story, Darnell. Sure love that house and your two cards are awesome as usual!! Darnell - love your beautiful flowers and that marble background really makes the stand out beautifully! Thanks so much for the story about the house - so romantic. Love it when you share stories, i.e., the Valentine clan. Also delighted that you have a cousin named Eunice, which was my Mother's name (a bit unusual). As for the cards...that first one is really lovely. The Malachite-y (new word) background makes your window box sing. And I smell a winner with your christmas card. Bet you have a nice supply of them, by now. I would really like to visit that house - thanks for the story behind it. Very interesting!! I could have sworn Minnie Mouse lived there!! That is a beautiful posies card but what really caught my eye was the use of the plaid to make the sentiment on that card. I love that look! ... you are better for the soul than Chicken Soup dear friend! Pepperoni!!! OMG - I totally lost it at that point. GREAT story! So, I really need to know...do you laugh out loud as you are writing your posts? Two fab cards pal! I love the marble mat - perfect backdrop for the gorgeous, beautifully blended flowers. 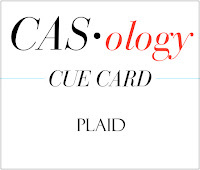 Totally swooning over the plaid greetings! I love the holly leaves and bedazzled berries! Love the small-ish size of the die. Both cards are gorgeous Darnell. Your designs are wonderful and I love the colours. Sorry I have missed commenting on so many of your fabulous cards. I hope all is well with you. 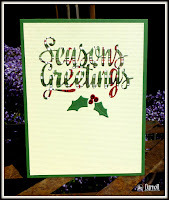 Two fabulous makes and I really love the colourful Seasons Greeting. Mega excited today as I have finally found the way to put challenge banners on my blog, only taken me 8 months lol. Both fabulous cards Darnell, I love the pretty colours of the flowers against the dark green background in the first one, and the CAS design of the second one is wonderful. That die cut greeting looks great cut from the plaid paper. That sounds like a fun challenge, and what a sweet card! 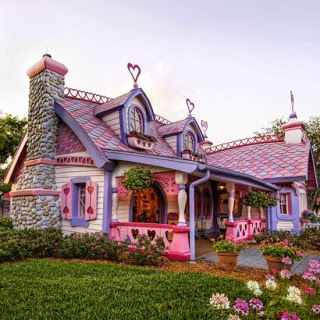 That's exactly the type of house I wanted to live in when I was a little girl! Great card inspired by it! Love the Christmas one too. I love the marble background on your first card. The Christmas card is really eye catching. That is a fairy princess house for sure. Pepperoni, now that's a name for ya!! 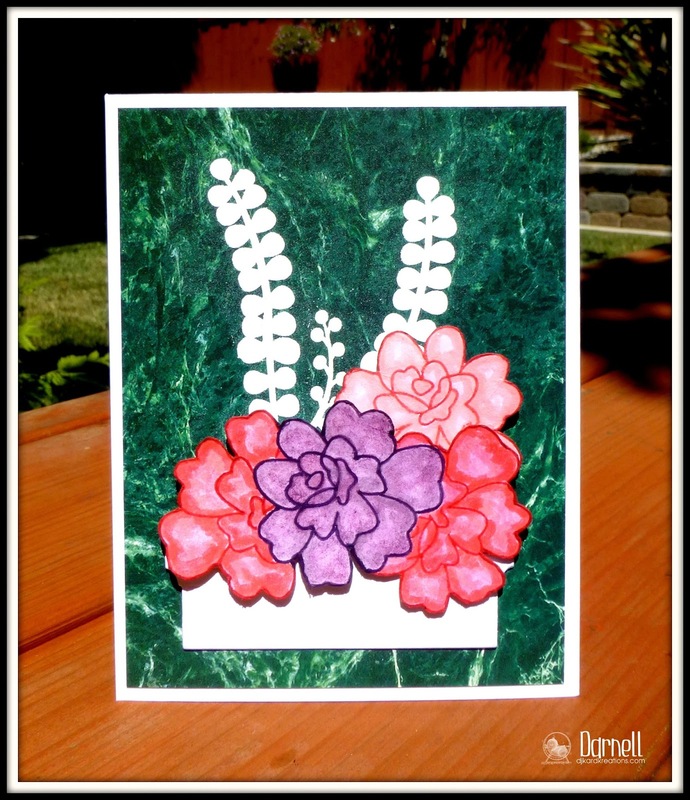 Your card is terrific, so lush with those deep with colors! I like your plaid season's greetings too, very cute! Great cards today, Darnell! Those blooms are lush and lovely. 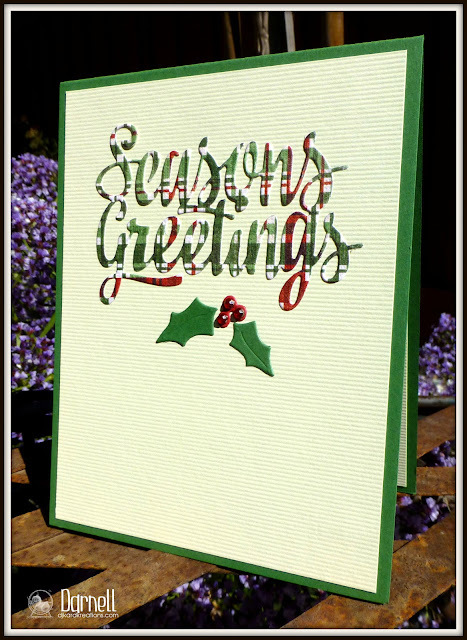 QACAS cards, like your Season's Greetings creation, are perfect to have in mind when Christmas suddenly knocks at the door. So fun to read the details about the Valentine house, too. Thanks for sharing them. Beautiful cards Darnell ..... love the die cut idea on the Christmas one, looks so festive! Thank you for the details on the Valentine house - amazing story and sound like wonderful happy people. Wonderful cards once again my friend ... Have a beautiful weekend! I must admit I struggle to believe that someone really would call their child Pepperoni, I just might have been heard to utter, .."only in America".. I guess it takes all kinds and Pepperoni is really a nice person,.. And the house well that is something else.too. Have sent you an email, to your gmail addy I thought. But maybe I have the wrong address. Would you please email me by hitting on this comment reply as I have my email on blogger,, if you haven't had the other one. What a house, what a story, what wonderful names, do fairytale like! 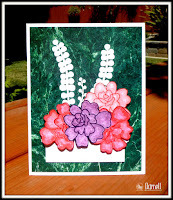 Your first card is a beautiful version of the photo, really like the color combo and elements. Your second card is wonderfully Christmasy and ultra CAS, a lovely combo. The house is really cute but I don't think I want it across the street from me. Both cards are lovely BUT I really like your Christmas card and the plaid paper and the textured background paper. Oh my gosh, that house looks like a little girl's dream doll house, so beautiful and charming, Fairies could live there, I wonder how it looks inside. Now Darnell, your cards are gorgeous, both so different from one another but lovely non the less. Love the colors on the first card, so rich and vibrant, the background is gorgeous. What a FUN post and lovely cards! When I first saw the photo, I thought maybe you had a new design studio!! Thanks for including the history for that adorable little house. Your cards are great too! Such a striking card with that marbled looking green background. Fabulous! What a wonderful story about the house. I would love to have a look inside all of the houses and I bet Phoebe and Max would too. I can imagine its just as magical on the inside as it is outside! 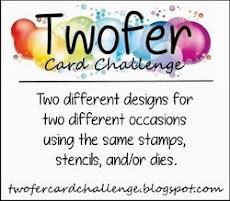 Your cards are lovely, those flowers go with the challenge photo perfectly and your plaid Xmas card is perfection. Your 'two-fer' is a 'win-ner'! Your flower box looks so lush and well watered! And I love the Christmas card! It's perfect in it's simplicity and so nice that it can go through the mail easily! I'm glad you shared it at Merry Monday too! Oh Darnell....I so enjoyed reading the story of that adorable home. How perfect are the girls names. On my next visit to your country I think I need to take a detour to "Valentine"! Your card is perfect....so bright and colorful! Love the Christmas card too! Is it that time of the year already? The weeks are just whooshing by. Have a great week! Very pretty and unique card! I really like the white leaves. Thanks so much for being a guest designer with Uniko this month! Beautiful summer card, but I really love the Christmas card, Darnell! Wonderful design! Pepperoni and Rose Bush..bwahahahahahahhaa! Yet again, another brilliant post! And your cards: only fantastical and magical! Flowers and plaid: love them both! Such a blast to see you over at Uniko as a GD - you did a super job and I loved your cards for over there!! Great take on the photo and the colors!! I loved that picture!! So fun! Your cards are delightful, as are you!! Good job on your post today - you are awesome and I hope life is finding you SMILING!!! Your cards are lovely!!! That green bg is simply stunning and the flowers are beautiful!!!!! And the Christmas card with the plaid sentiment - perfect!!! !